Members of our cercle français have been in touch to express their support and sympathy for those affected by the Paris attacks of last Friday. 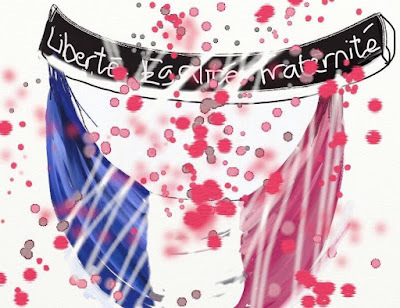 Some recalled our January post, highlighting the words of a song, to affirm that Paris sera toujours Paris . While many followed and shared updates on social media others used the platforms to convey their own reactions. Two of those are posted here: the picture above from Àine, who provided our art talk last December, and this heart-felt piece in both French and English from our frequent contributor, Hélène.…..
Hier soir, alors que je découvrais l’horreur des attaques à Paris et au Grand Stade, je suis tombée sur des commentaires de lecteurs disant que la France n’existait plus, qu’il fallait quitter le navire avant qu’il ne soit trop tard, des messages pessimistes et défaitistes. Au-delà de l’horreur, je découvrais une France qui avait peur. Et puis petit à petit, j’ai lu des nouvelles avec une lueur d’espoir, des récits héroïques sans héros, des histoires de personnes qui ouvraient leurs portes à ceux qui venaient d’être témoins du pire que l’espèce humaine puisse faire, des chauffeurs de taxi qui emmenaient les gens loin de la violence sans les faire payer, des personnes qui allaient au secours d’autres sans penser une seconde qu’ils risquaient leur vie, des personnes hissant de parfaits inconnus sur le toit du Bataclan… Hier soir, malgré l’horreur, au-delà de la violence et de l’horreur humaine, j’ai reconnu la France dont je suis fière, celle où nous restons unis et solidaires et plus forts que les ténèbres. Last night, as I was discovering the sheer horror of the attacks in Paris, I came across comments about France not being France anymore, about people fleeing away from a sinking ship, messages full of pessimism and defeatism. Beyond the horror, I discovered a country that was scared. Then gradually, as I continued reading, I saw a glimmer of hope through heroic stories with unlikely heroes, stories of Parisians opening their doors to welcome people who had just witnessed the worst thing humans can do to each other, taxi drivers ferrying people away from the violence and not charging them, people rescuing others without thinking that they could lose their own lives, people lifting complete strangers onto the roof of Le Bataclan… Last night, despite the horror, beyond the violence and the horror of humankind, I recognised the France I am proud of, the one where we are united and standing together, stronger than darkness. Note: A minute's silence was observed today in Belfast, reported here by BBC Northern Ireland, and a book of condolence for those killed and injured was also opened at Belfast City Hall. The French Embassy in Dublin has offered people the opportunity to e-mail messages of condolence to jesuisparisireland@gmail.com which will then be published online on this dedicated page of its site. 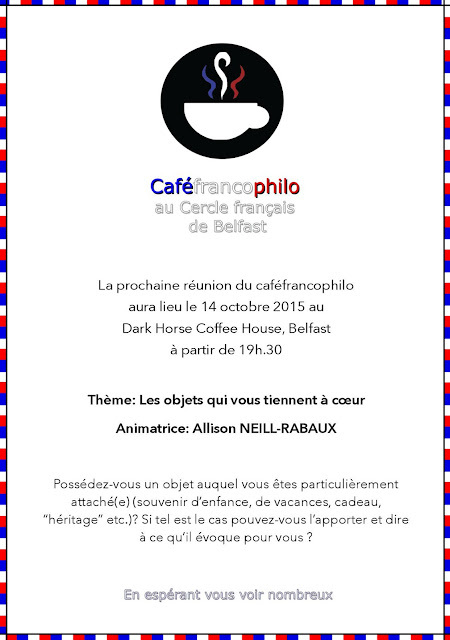 In addition to our monthly meeting, November sees a number of events with a French theme taking place in Belfast including a book launch, a Film Festival and of course Bal Feirste's regular session of French music and dance. It is almost 100 years since the battle of Verdun. In this exploration of War and Memory members of the cercle share their reflections of this devastating event. 'Snugville Street' by Angeline Kelly is a novel about a French exchange set in the Shankill. Angeline studied French at university and when she took a career break in January to try to do some writing, her experiences of France were immediately put at the heart of her novel. 'Snugville Street' is a family drama that revolves around a French exchange. It's happy and sad, and layered with themes of identity and language as it moves from Snugville Street in the Shankill to Paimpol in Brittany. So far, the book has had great reviews. 'Snugville Street' will have its Belfast book launch in the Shankill Road Library on Thursday 19th November at 6.30pm. A Feast of French Films at QFT. 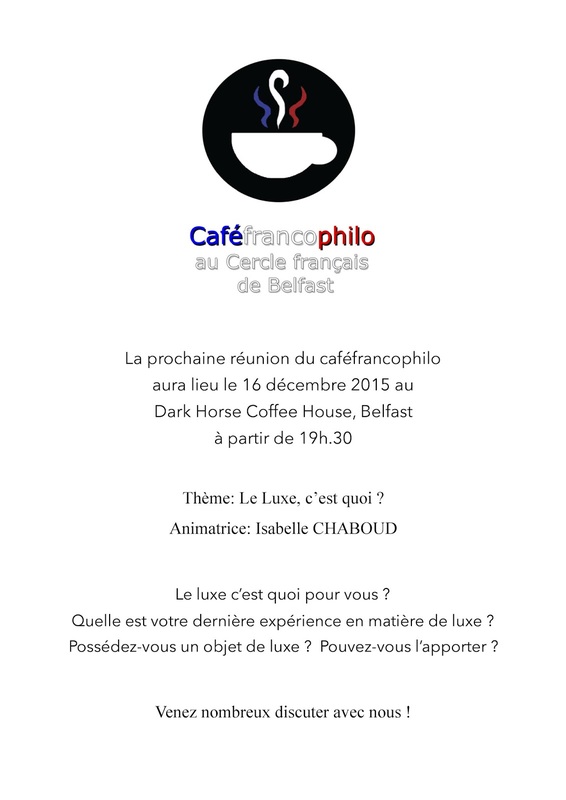 This month QFT welcomes the 23rd French Film Festival – the only festival of Francophone Films in the UK. QFT will be screening seven films …. For full details of these and QFT's programme for November click here. 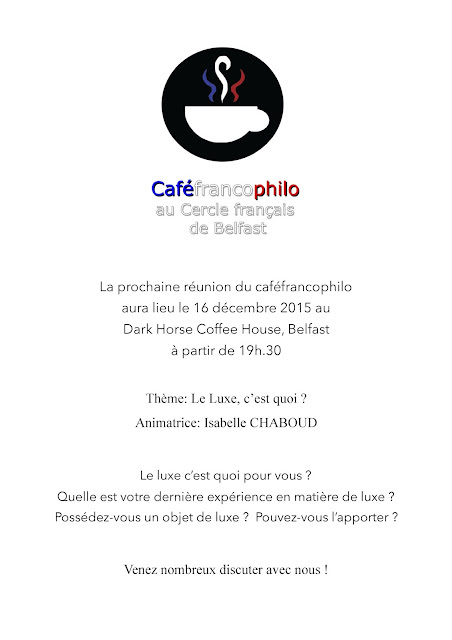 Looking forward to seeing you in the Dark Horse Café on Wednesday 11thNovember.